The more devices you have connected the faster you can iterate on design and testing. 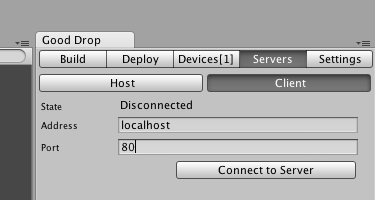 Unity3D's default setting is to build and push to the 'default' usb connected device. Pushing to all connected devices saves you time and energy. 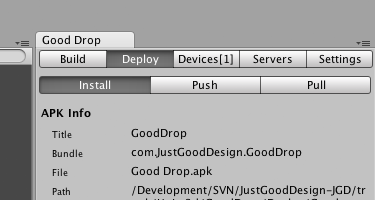 Good Drop delivers built Android packages (APK) to any connected devices at the same time - because it's multi-threaded goodness. 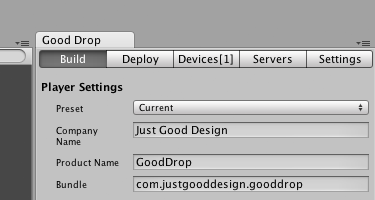 If you have Unity3D Pro you can create a new build before you push to your devices. Install from an APK, push to a device, or even pull data. Devices can be attached or connect via wifi. Not only can you install devices connected to your own machine, but to devices connected to other machines.